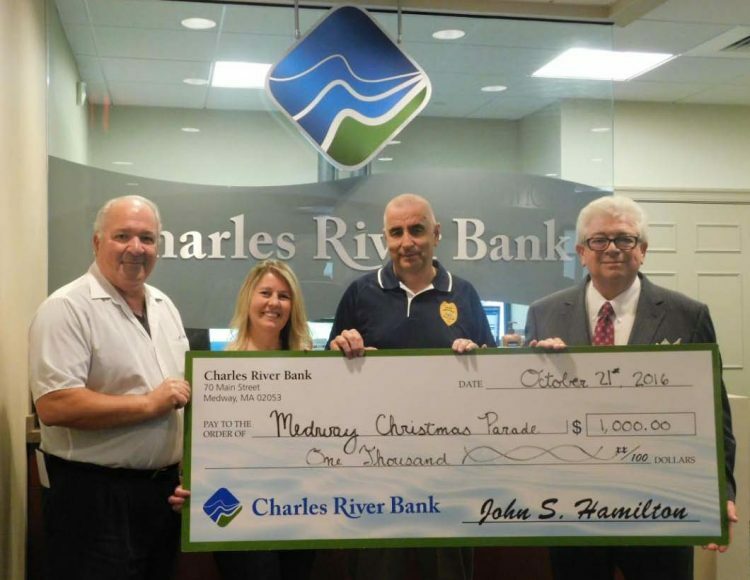 (Medway) Charles River Bank President and CEO Jack Hamilton presents a donation check of $1,000 to the Medway Christmas Parade Committee, represented by Vice President of EPCO Inc. Richard Parrella, Town of Medway Treasurer/Collector Joanne Russo and Chief of Medway Police Allen Tingley. This year’s parade will be held on Saturday, November 26th and will begin at 5:30pm at the Medway Middle School. The parade will end at Choate Park where visitors will be treated to a snack bar inside the Thayer House, fireworks and a visit from Santa Claus!